When registering the first bird banding of the season, we sometimes find little chicks that do not thrive as their siblings. We also find newborns without an adequate care due to inexperienced parents that are not yet synchronized as a couple and cannot carry out successfully this important task. In these cases, the option is to hand raise them and help them to grow into healthy birds. For that purpose and in order to respond to the unavoidable changes, we need protocols to follow and to react immediately and continuously. Hand rearing is not like following precisely a recipe: every day is different, as it is every bird and every specie. The little changes in the chick bodies as well as the changes of weight or attitude will alert us and tell us how we should intervene. In this sense the keepers in charge of these tasks have an important role when it comes to raise successfully the offspring. 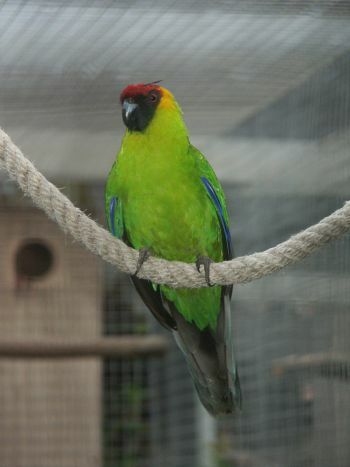 For some parrots species, this task takes sometimes several months. In general, parrot chicks are born with a weight that in some species does not exceed 6 grams and in the first days the temperature must be very stable and elevated. Above 36ºC. Especially in cases where several nest sharing chickens are not available, it is always more beneficial when more than one young baby, of similar age, shares a nest during growth, as they receive mutual heat through contact and not only depend on the ambient temperature. The crop will also get better stimulated and a competition to receive the food arises, which provokes a natural stimulus in the movement of the little ones. Compensate the nests when they have several pairs of the same species and coincide in the clutches within a chronological margin, allows the breeder to balance the numbers and effort of the parents. The same happens to clutches when they have a very low number of eggs compared to others that may have an excess. In the breeding season of Loro Parque Fundación the Horned Parakeets (Eunymphicus cornutus) have made the first laying of the season. Apparently they are fertile and we handle with special care since the males are nervous during this period. Older males can become extremely aggressive with females that may even lose their lives in one of these sudden attacks. The registration and analysis of births is important for any breeding centre, as they describe a roadmap for the following seasons quite correctly. With the birth dates of each year we can make a forecast to prepare the pairs that are breeding. In the last month we have had births of species such as the scarlet macaw (Ara macao). Different species of eclectus parrots, Eclectus roratus roratus and Eclectus roratus vosmaeri; but also the orange-fronted parakeets (Eupsittula canicularis) that usually begin at the beginning of the year already had offspring. The iris lorikeet (Psitteuteles iris) also has a baby. This species is establishing itself as a stable breeding species at Loro Parque Fundación. 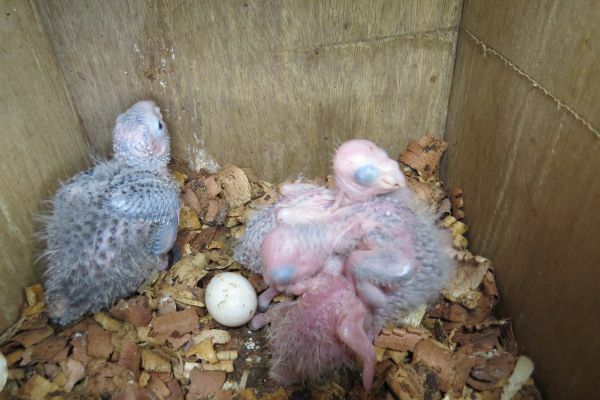 South American parakeets such as Pyrrhuras have also started laying. We already found chicks in the nests of the Pearly Parakeet (Pyrrhura lepida coerulescens), Green-cheeked Parakeet (Pyrrhura molinae restricta) and the Crimson-bellied parakeet (Pyrrhura perlata). Seeing the eggs in the nests is very exciting, but listening from the outside of the nests is an even deeper satisfaction. Some of the field projects supported by Loro Parque Fundación are also in a similar phase. 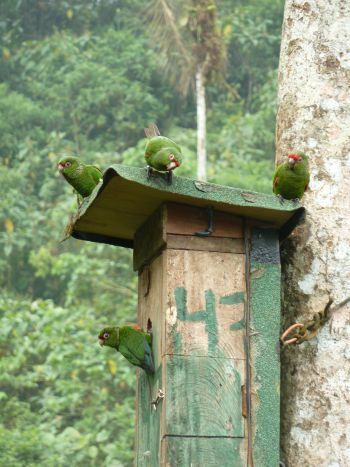 From Ecuador our local ally, the foundation Jocotoco, informed us these days that the El Oro parakeet (Pyrrhura orcesi) already had eggs and babies in the nest boxes that are monitored to observe and see the evolution of the species data. The El Oro parakeet lives in the western part of southern Ecuador in a specific altitudinal range between 900-1,500 meters above sea level. Their habitat has been reduced and their populations do not exceed one thousand individuals. The Buenaventura Reserve, where a good group of protected specimens of this species lives, is the one that offers a continuous canopy where they can thrive thanks to the different conservation actions implemented. The particularity of these parakeets is that they breed in a colony and in the same nest several specimens are responsible for the continuous tasks involved in reproduction. Loro Parque Fundación has financed this project with more than 400,000 dollars, seeing in the following years how a habitat is conserved and other species of frogs or even orchids that have been discovered for the first time for science within the framework of the Buenaventura Reserve benefit.